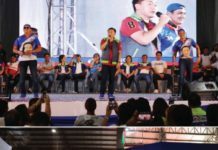 TACLOBAN CITY – The Philippine National Police (PNP) in the region awarded its performing units during the 27th PNP Founding Anniversary held March 12. Leyte Police Provincial Office (LPPO) bested five other police provincial offices for the Best Police Provincial Office award while Ormoc City Police Office (OCPO) was awarded as the Best City Police Office and Calbayog City Police Station was awarded as the Best Component City Police Station. In the municipal level, Barugo Municipal Police Station was awarded as Best Municipal Police Station (Type A and B) and Bobon Municipal Police Station was awarded as Best Municipal Police Station (Type C). The Ormoc City Police Office (OCPO) 3 bagged the Best Police Station at the City Police Office level. For the Best in Police Intelligence, Eastern Samar Provincial Police Office bagged the award, while the OCPO bagged the Best in Police Operations. LPPO bagged the Best in Police Community Relations and OCPO bagged the Best in Police Investigation. The Leyte Provincial Mobile Force Company bagged the Best Provincial Mobile Force Company and the 801st Maneuver Company, RMFB8 as the Best RMFB 8 Maneuver Company. Also, a total of 261 police personnel were also promoted, nine were promoted to superintendents; two to police chief inspectors; 20 to police senior inspectors; 59 to police inspectors; 45 to senior police officer 3; 33 to senior police officer 2; 72 to senior police officer 1; 97 to police officer 3; and 69 to police officer 2. “Please continue supporting the PNP.Policemen are always here to support, help and secure people whoever they are. There is no distinction as to whom who will protect for as long as you need our help, policemen will always be there to help you,” Police Regional Director Gilberto Cruz said. The awarding of promotion was held at the Robinsons Mall in Abucay and attended by top regional police officials and the families of the newly-promoted PNP personnel.